The fastest quicklook quantitative petrophysical analysis is accomplished by using spreadsheet software, such as Excel or Lotus 1-2-3. Details of the math for elastic properties and fracture stress are explained in other Chapters of this Handbook. 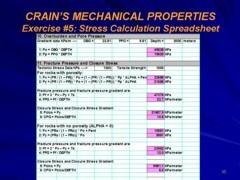 Below is a sample spreadsheet for a typical elastic properties and fracture pressure and closure stress example.